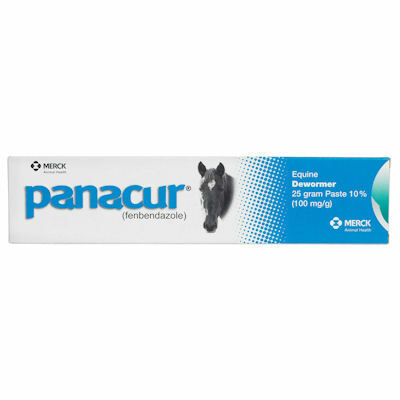 Panacur Paste (Merck) 25 gram Horse Dewormer for use in Horses, Foals and Ponies. One tube Deworms a 1,100lb. horse. Safe for use in horses including pregnant mares and very young foals. Broad spectrum efficacy. Highly effective against the predominant internal parasites of horses: large strongyles, small strongyles, pinworms and ascarids. Convenient, oral paste administration. This paste formulation 10% (100mg/g) fenbendazole.